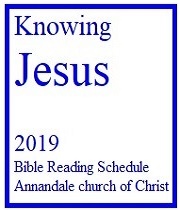 We at the Annandale church of Christ are a family united in love by our belief in Jesus as our savior and the Bible as the inspired word of God. While our backgrounds are diverse, our goals in the present and hopes for the future are the same - to live by God's plan for our lives and to join Him in heaven when we leave this earth. We are an independent congregation. We base our fellowship together solely on the word of God just as the first Christians did. We worship God together, grow in our understanding of His will together, and support the sharing of the good news about Jesus around the United States and the world. We invite you to join us at any of our Bible studies or worship services. When you visit, you - and your children! - will be welcomed as guests. At our worship services, we read and study God's word, sing, and pray. Every Sunday, we remember Christ's death and resurrection by sharing the Lord's Supper. Our lessons are based on the Bible alone and not on any book, creed, or confession. We look forward to sharing the love and joy of salvation in Christ with you!